Means for different welding plant different V-I characteristics. It shows the relationship between the arc voltage and arc current. During the welding arc length between the electrode tip and the workpiece determines the arc resistance and consequently the potential drop across the arc. In other manner, the arc length find out the arc voltage longer the arc length higher the arc voltage and it is this voltage which allow certain flow of current according of the characteristics of welding plant (unit). Our all concentration will be on only drooping type characteristics as it is used mostly in arc welding machine plant, both ac and dc type. 1. Drooping Type (Constant Current): Drooping V-I characteristics is used on constant current type welding machine. 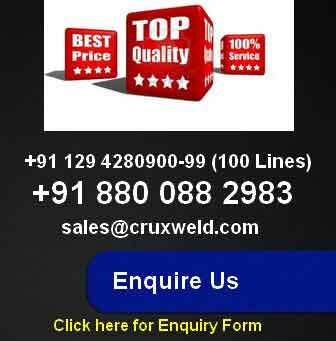 When arc is struck in arc welding machine (GMAW Welding Machine) electrode is essentially in short-circuit which would immediately required a sudden of current otherwise machine is design to prevent this. A constant current machine is design to minimise theses sudden surges. As we know that a manual metal arc welding plant consist a drooping V-I characteristics. Drooping means that the terminal voltage of welding machine decreases as the welding current increases. In arc welding machine (MMA Welding) , arc length (gap between the workpiece and electrode) length, from a shorter arc B to longer arc A, there is a marked variation(K) in the voltage but the corresponding variation (c) in the current is very small. 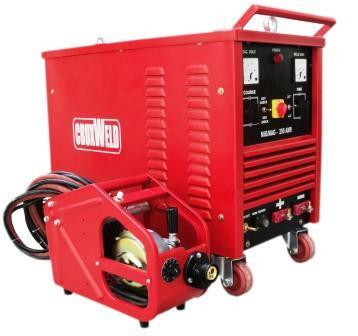 Drooping V-I characteristic is applicable for both AC and DC welding machine which is used for SMAW Welding Machine, TIG Welding Machine, and Submerged Arc Welding Machine (SAW Welding Machine) and Plasma Arc Welding Machine and the MMA (Manual Metal Arc) Welding Machine, voltage at the time of welding is approximate 30-40 V.
2. Flat or constant voltage type characteristics are used with semi-automatic MIG Welding Machine and other automatic welding machines. 3. Rising voltage type characteristics are used with fully automatic welding machine. a) Open circuit voltage usually is in the range of 70 to 80 volt. In welding circuit flow of current is controlled by inductor in line between the electrode and transformer current can be vary by varying the inductance. For current control during welding a means of varying this inductance is must. V-I characteristics of a welding machine has a great effect on the process of welding as different welding process use welding plants with different V-I characteristic.